(Nanowerk News) Another innovative feature has been added to the world’s first practical “artificial leaf,” making the device even more suitable for providing people in developing countries and remote areas with electricity, scientists reported here today. It gives the leaf the ability to self-heal damage that occurs during production of energy. 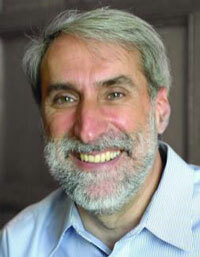 Daniel G. Nocera Daniel G. Nocera, Ph.D., described the advance during the “Kavli Foundation Innovations in Chemistry Lecture” at the 245th National Meeting & Exposition of the American Chemical Society, the world’s largest scientific society. About 14,000 scientists and others are expected for the meeting, which continues through Thursday with almost 12,000 reports on advances in science. Nocera, leader of the research team, explained that the “leaf” mimics the ability of real leaves to produce energy from sunlight and water. The device, however, actually is a simple catalyst-coated wafer of silicon, rather than a complicated reproduction of the photosynthesis mechanism in real leaves. Dropped into a jar of water and exposed to sunlight, catalysts in the device break water down into its components, hydrogen and oxygen. Those gases bubble up and can be collected and used as fuel to produce electricity in fuel cells. Nocera, who is the Patterson Rockwood Professor of Energy at Harvard University, explained that the artificial leaf likely would find its first uses in providing “personalized” electricity to individual homes in areas that lack traditional electric power generating stations and electric transmission lines. Less than one quart of drinking water, for instance, would be enough to provide about 100 watts of electricity 24 hours a day. Earlier versions of the leaf required pure water, because bacteria eventually formed biofilms on the leaf’s surface, shutting down production. Nocera said that about 3 billion people today live in areas that lack access to traditional electric production and distribution systems. That population will grow by billions in the decades ahead. About 1 billion people in the developing world already lack reliable access to clean water. Thus, a clear need exists for a simple device like the artificial leaf that’s compatible with local conditions. Earlier devices used rare, costly metals and other materials, involved complicated wiring and were expensive to manufacture. But Nocera’s artificial leaf uses less-expensive materials and incorporates a design — a so-called “buried junction” — that is simple and would be inexpensive to mass produce. And the leaf has advantages over solar panels, which are costly and produce energy only during daylight hours. The leaf’s hydrogen and oxygen, in contrast, can be stored and used at night. Among the team’s priorities for further development of the device: integrating it with technology for converting the hydrogen into a liquid fuel that could run traditional portable electric generators or even cars. Nocera acknowledged research funding from the National Science Foundation, the Department of Energy and the Air Force Office of Scientific Research. Sponsored by The Kavli Foundation, a philanthropic organization that supports basic scientific research, Nocera’s talk is part of a series of designed to address the urgent need for vigorous, “outside the box” thinking by scientists as they tackle the world’s mounting challenges, including climate change, emerging diseases and water and energy shortages.